Synopsis: After an eight year absence and now an outlaw accused of killing Harvey Dent in the last installment, Batman returns to Gotham City to save it from sure destruction by the evil terrorists and their leader Bane. Review: The third part of this Christopher Nolan directed trilogy makes you pause and consider the nature of the relentless terrorist Bane in light of the tragedy that befell the midnight movie-goers at the now infamous showing in Aurora, Colorado. I couldn’t help but get the eerie feeling that this film could become a landmark in pushing our politicians into passing new gun control laws, one can only hope. 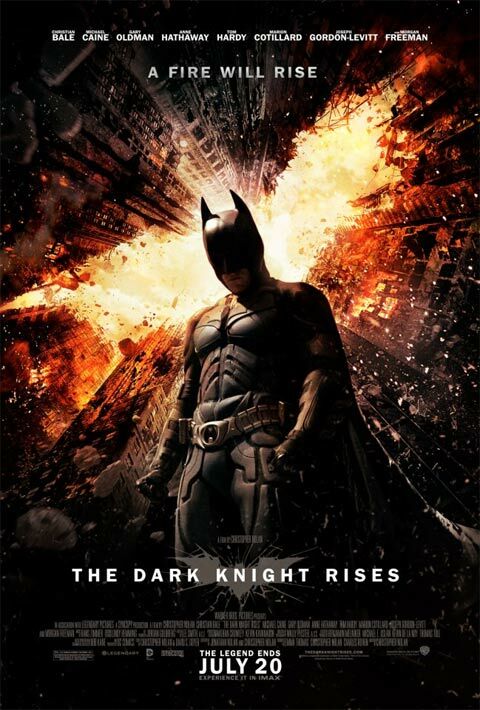 That said The Dark Knight Rises is the most timely and emotionally felt story of the Nolan Batman films. Bale’s Batman is the most multilayered of the three films as seen in his struggles going from recluse into hero. As Bruce Wayne watches his beloved Gotham City become under siege by Bane and his group of terrorists Wayne wrestles with his past and wonders if Gotham needs him to return. Anne Hathaway plays Catwoman and she is an enigma fighting both her good side and her jewel thief/dangerous side. Catwoman is intrigued by Wayne/Batman who has been living as hermit for the past eight years and finds that she and Wayne have more in common that she needs to deal with. They are both driven by good and bad and she has to decide if she should walk the fine line and become allied with Batman. Marion Cotillard has the least to do as Miranda a rich business woman who is also intrigued by Wayne. She is the only woman Wayne trusts to run his company after Bane using software stolen from the stock exchange wipes out Wayne’s fortune. Michael Caine plays Alfred, Bruce Wayne’s loyal butler/father figure. Caine’s portrayal is real and sympathetic once again proving how excellent an actor he is. He portrays Alfred as an unsung hero. Morgan Freeman is the gadget inventor Fox, at Wayne Enterprises, who develops secret military projects such as specialized armed tanks, a black one that becomes the Batmobile and a new source of energy buried miles beneath Gotham that Bane is after as an integral part of the plot. Gary Oldman is so believable as Commissioner Gordan, his understanding of the Batman and the city’s need to have him return is undeniably ingrained in him in a way that makes you realise he wishes he could be more like Batman. Oldman does this with understatement and this drives him to save his captured police force. Joseph Gordan-Levitt plays Officer Blake who also had lost his parents and is an orphan like Wayne. His character is also relentless in saving people’s lives and is driven by circumstance. Holy Robin Batman……although not in this movie it is alluded to perhaps for a future installment. This film is very dark and serious compared to the first installment and some remarks the Catwoman makes about preferring to use guns as opposed to Batman who would rather fight without them becomes a poignant reminder of the tragedy that played out at the theater in Aurora. Is this a case where life imitates art or the other way around given the class warfare in our country today and the extremism of politics going on. The movie depicts Bane and company stripping the wealthy of their money and possessions and putting them on trial for their misdeeds to the public. Should you go see it, I would say yes and keep a prayer in your hearts for the victims in Aurora and their families.